Three weeks ago, in the most dramatic installment of Fantasy Fantasy Football ever, Michael Fabiano came roaring from behind to stun Eric Mack and win the regular-season championship. It looked like Mack would run away with the title. But Fabiano made history — and made himself a legend — with the stirring comeback. And then it was time for: THE PLAYOFFS! Week 14 — Mike Harmon won the play-in game, defeating Matthew Berry in OT. 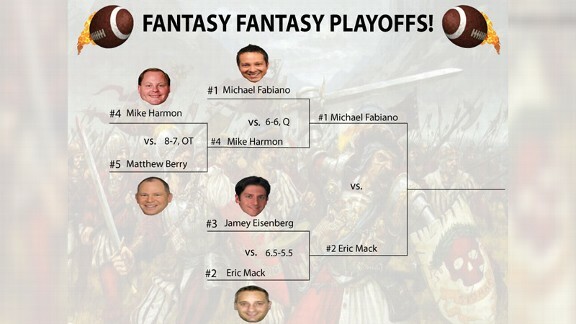 Week 15 — Michael Fabiano took down Harmon to defend his 1-seed and make the title game. 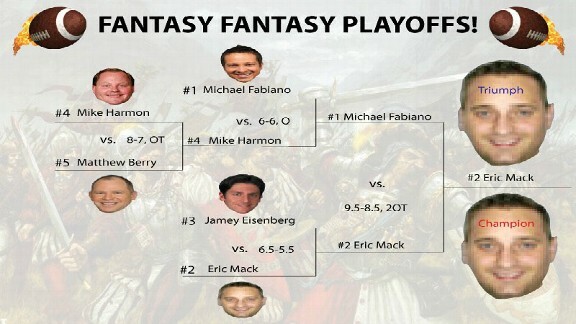 Week 16 — Eric Mack knocks off Eisenberg, setting up a championship rematch with Fabiano. And now … THE SUPER BOWL. We’ll be using the Week 16 stats again, mostly because Mack didn’t write a Week 17 column, but also because Week 16 is the true title week anyway. The rematch always seemed like destiny since the end of the regular season, and now the wait is over. Let’s find out who will take home the first ever Fantasy Fantasy Lombardi Trophy! The Super Bowl has begun. You have to wonder if the extra bye week upset Fabiano’s rhythm. He came out just missing on several quarterback picks, leading to a mediocre opening round. Astute Fantasy Fantasy fans will notice we’re using the same exact numbers for Mack as the semifinal round, which was also Week 16. He did a good job, and it won’t be easy for Fabiano to top him. Onward. Fabiano couldn’t afford to lose the running backs, and perhaps he gave himself a bit of traction with the draw. True, he still trails, but it kept him within one category of tying things up. He’ll need to pull off a stunner in receivers, though, if he plans to win the title. Interlude 3: The Super Bowl Hangs in the Balance! Wow! Talk about hanging around. Fabiano refuses to go out without a fight. After a rough initial category, he’s managed to salvage a draw twice, putting him within striking distance as we head into what may be the final category of the season. A brave effort, but let’s see if Mack can finish him off. A quick quality check reveals that Fabiano went 22/36 on the day, while Mack was 24/38. It’s too close to call, which means that we’re going to overtime! You hate to see it come down to the kicker, folks, but at the same time, you love it. It’s like penalties in soccer — it’s by far the most dramatic aspect of the game, and perhaps the least representative. Let’s see if the men of the foot can distinguish our two champions. He’s done it! He’s done it! Eric Mack has exorcised the ghosts of the regular season, shaken off a collapse in the Super Bowl, and come back in overtime to win the Fantasy Fantasy Football title! Thanks for following Fantasy Fantasy Football in 2011, and never forget the grit our two champions showed on the final day.